VINTAGE SKY BLUE FOILED ENCASED TANGERINE SWIRL ART GLASS NECKLACE-CHOKER 20.5"
Vintage Necklace Czech Faceted Blue Crystals Art Deco Sterling 31"
It is worn collar style, higher on the neck. 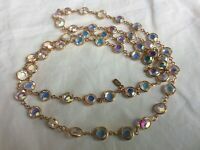 The necklace has sparkling Aurora Borealis crystal beads and fluted oval gold plated beads and spacers. If your neck is slim, this is a great necklace for you, and it has such a beautiful sparkle.